Heat recovery systems can come in a variety of forms, but all involve some form of heat exchanger. This sits in the building, usually in the loft or on the roof, and pipes feed down from it into each room, drawing out the stale air and replacing it with warmed, clean air. Most of the examples in this section refer to ventilation heat recovery systems but it can equally apply to a number of processes including heat pumps that convert ground and air heat, and combined heat and power (CHP) systems. With the largest air recovery efficiency of all the ventilation systems, thermal wheel units also tend to be much bigger in size. They are made up of two large wheels with a honeycomb array, one half of which is drawing in stale/exhaust air, the other half fresh air from outside. The wheels rotate in opposite directions to each other and the energy from the stale/exhaust air is transferred to the incoming air, heating it up. The heat exchanger wheels are normally made of aluminium but can actually be constructed from a wide range of materials including plastic and even paper. The benefit of the thermal wheel is that it is highly efficient (up to a maximum of 80%) compared to other systems and is likely to provide a quicker return on investment if set up properly. 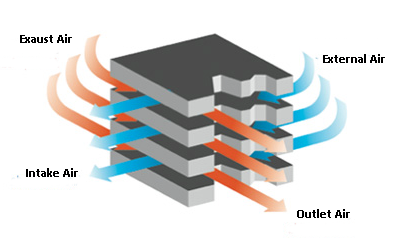 As a heat recovery system the speed of rotation of the wheels, and the amount of energy transferred, can be controlled to raise or lower the temperature of the air that is fed back into the building. More common than thermal wheel heat recovery because it can be utilised on a smaller scale is plate heat or recuperator technology. It comprises a box with a series of parallel plates made from metal or plastic which allows the extracted air to pass over the incoming air, transferring the energy and heating it up. The air streams are separated by the plates and never touch so one of the key factors in the efficiency of any system is how thin and conductive the individual plates are. Plate heat recovery systems generally have an efficiency of around 70% at their best. Heat pumps take the heat from one area and transfer it to another location. They operate in a similar way to a refrigeration unit and can be used for both cooling and warming the air. There are a number of different varieties and they can draw heat from the outside air as well as from the ground through the use of a network of pipes. Find out more about heat pumps here. 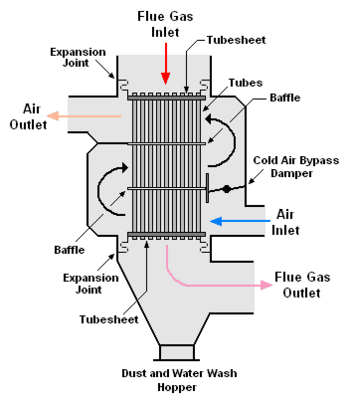 A run around coil can be introduced to an existing air handing system and typically consists of two coils that are connected to each other by a pumped circuit of pipes. Water is normally used to charge the circuit, picking up the heat from the exhaust pipe and transferring it to the supply air coil. 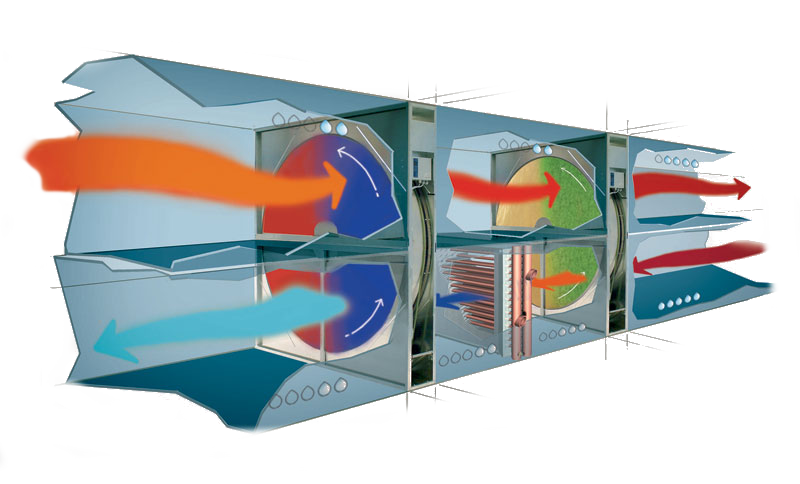 Heat recovery systems such as these are used where the two air streams are not close enough for more efficient systems such as the thermal wheel or recuperator technology. 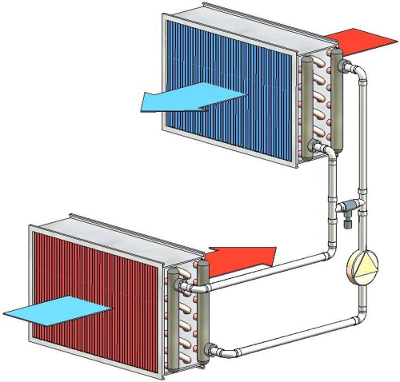 It generally delivers a maximum efficiency of around 50%. 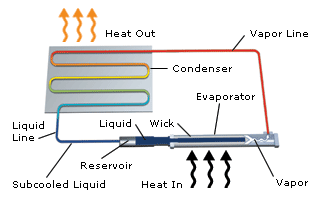 Of all the heat recovery systems, heat pipes are the lowest maintenance. They can, however, only be used where the air handling is done in one system. It uses a tube system with a refrigerant to extract the heat from the exhaust air and pass it to the supply air. Vertical pipes use the evaporation of the refrigerant to transfer the heat whilst horizontal ones incorporate wicks within the pipework that also allow the transfer of refrigerant. Vertical arrays (max 75%) are more efficient than horizontal (max 50%). As heat recovery systems, boiler flue economisers can now be fitted as a matter of course on new boilers. They can also be retro fitted to older models and capture the heated vapour which can then be used in a variety of ways to improve the boiler efficiency. In most cases efficiencies of 5 to 15% can be obtained by condensing or non-condensing gas-to-water systems. A wide range of industrial processes produce heat and gasses that can benefit from heat recovery systems including those that create evaporation such as distilleries where wasteful heat can quickly escape into the atmosphere. Process cooling and heating, pasteurisation, large scale laundry drying and even ovens can all have heat recovery systems attached to save energy which can then be recycled to provide heating for other uses. Heat recovery is one of the major issues for the sustainable energy industry, making the most of what we produce and creating more efficient heating systems from the home to the heart of our homes, offices and factories. For a more detailed overview of the full range of heat recovery systems, visit the Carbon Trust.